I am a candidate for the city council of Apache Junction. The election is being held November 8th, 2016. This is an important election for our community. We are sitting on a precipice. We can either go forward or backwards. If we continue to stay where we are, we will get run over by the surrounding communities. The future is ours to grab ahold of and run. This will take fresh ideas to tackle the challenges that we are facing. The old ideas and ways will not get us to a good and prosperous future. First, a little insight into who I am. I was born and raised in Rapid City SD. I graduated from Northern State University in Aberdeen SD Where I earned a degree in accounting and finance with a minor in economics. Right out of college I took an accounting position with the SD Dept of Transportation and later with SD Dept of Health. I then became the Chief Financial Officer for a hospital, NH and medical clinic in Harlowton, MT where I was later promoted to be the administrator. During the next ten years I served in the same position in facilities in Lusk, Wyoming, and Butte, Montana. In 1999 we moved to the valley where I opened Padgett Business Services. We provide accounting and tax preparations for small businesses and individuals. My staff and I have grown the business into offices in Apache Junction, Mesa and Phoenix. Over the years I have served on a number of boards and committees including Boy Scouts, mental health, church, chambers of commerce and health care associations. While in Montana and Wyoming I was a certified EMT. I have been a member, appointed by the city council in 2013, of the Superstition Mountain Community Facility District #1. Also known as the sewer board. I see the role of the city council is to set the community vision. The council members share the responsibility to listen, question and decide. This can only be accomplished when the council members make themselves available to the citizens to hear citizen's views and to explain the decisions that were made by the council. This has to be done with the mindset to do what is best for the community as a whole and not to certain segments, groups, or individuals. If you have any questions about my position on any given issue, please do not hesitate to contact me. “My Vision for Apache Junction is to be the example of prosperity, compassion, and future thinking for all other communities of Arizona and the nation. It is important to understand why you do what you do. This is your purpose or vision to pursue in life. Your vision is something that you will endeavor to achieve your whole life. After determining your vision, goals must be developed to accomplish that which will move you and others towards the same vision. The goals will change over time as they are attained and different goals start to develop. Allow me to explain the vision I have for Apache Junction. This vision consists of three sections: prosperity, compassion, and future thinking. 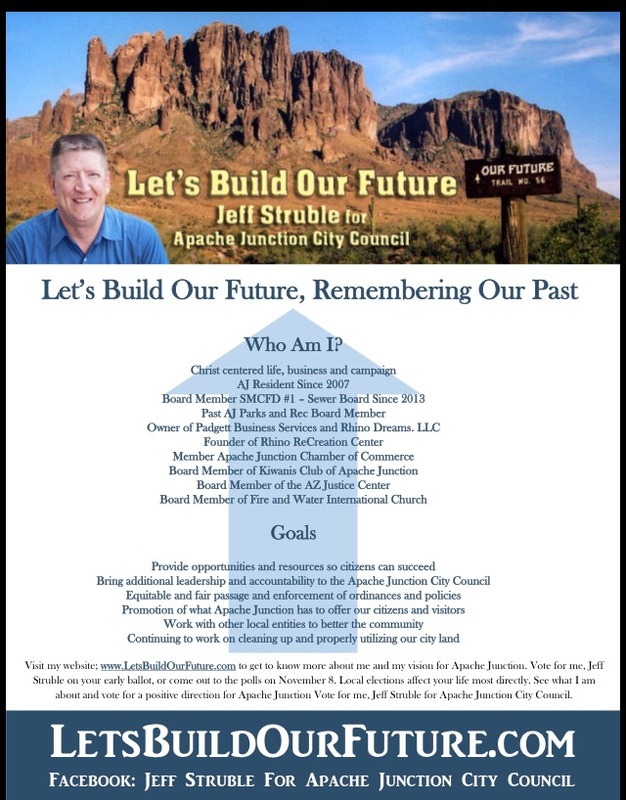 My vision is for Apache Junction to be the community that others look to when thinking of growth and development of the available lands, resources, and human ingenuity. The City has the ability to implement and enforce the proper policies and regulations that will enable businesses to compete in a fair and equitable marketplace. It is not the City's job to pick winners and losers - meaning those who will survive in a competitive marketplace. When businesses prosper in the community, then more local people are hired. This allows the employees to purchase a home, shop locally, and their kids, in turn, attend local schools. Home ownership promotes responsibility and pride in the up-keep of a home and neighborhoods. Well-kept homes are more appealing to a buyer which, in turn, helps the seller to profit by selling their home when desired. As the buying and selling cycle continues, we will see a cleaner city in which property values will increase. In response, property tax revenue will increase. Government agencies that depend and operate on property tax revenue will see greater gains. We will see schools have more funds available for providing services to the students of the community. As a result, governing boards are able to lower the tax levies needed to raise the required revenue. As the cycle develops, new businesses are enticed and see incentive to move to our community. More manufacturing, distribution, and service facilities are present. Employers will look to hire more people which only further perpetuates the act of more people moving to our City. In response, adequate housing must be available. This will also increase the need for ancillary services and retail businesses to serve the new people. As this happens, the City's revenue will increase, allowing it to be less dependent on higher level governments for funding. The City will also be able to promote itself to other parts of the state, nation and the world. Tourists visiting our activity venues, surrounding mountains, parks, and lakes only bring in additional tax revenue. As John Wooden, the legendary coach of UCLA, once said, "Don't worry about what you can't do, just do what you can do." We, Apache Junction, just need to start. Let us stop saying we can't and stop using the excuse that we have never been able to. We will find that as we do what we are able to, those things which we once thought impossible, suddenly become possible. Compassion is defined in the dictionary as sympathy, pity, and concern for the sufferings or misfortunes of others. I like the definition that former Congressman Jack Kemp gave us, "Compassion is not how many people live on the government welfare plantation, but how many of our people are liberated from government dependence." He also said, "The goal of government is not to secure happiness, but to secure the God given inalienable right to pursue happiness, to live our lives in obedience to our conscience, not to government." I say all of this about compassion to help people understand that they can stand on their own two feet. They do not need to lean upon the government in order to make their lives whole. This self-reliant thinking can also be implemented when it comes to lower level government, becoming independent from its higher level government; city to county, county to state, state to federal. As an inverse, the less money the federal government is able to collect for redistribution, the less regulations and power they will have over the states, counties, cities, and citizens. We, as a community, need to get back to neighbors helping neighbors and churches and nonprofits helping people without relying on government subsidies. A dollar in the hand of a giving person, church, or nonprofit is more effective and efficient in providing the services needed than government programs, as the overhead and waste is less. 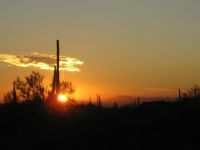 As Apache Junction becomes more disciplined and self-reliant through our collective prosperity, we will be able to provide services without the assistance of higher level government grants and subsidies, all which come with strings attached. A rational citizen may say, "If we don't get the money, others will take our share and become more prosperous." Remember though, we will be the example of compassion to other communities in Arizona and the nation. As others see we are more successful at being compassionate, they, in turn, will see the benefits. The same may say, "What are the benefits?" Some of the benefits include less crime, drug abuse, truancy, and unsightly properties. As mentioned, desire will increase for others to come to our community. We become less reliant on higher level government grants, subsidies, and related "strings." In this way the cycle is built up. Now let us visit the idea of future thinking. This term could even be called, "thinking outside of the box" or "free thinking." In his book, The Contrarian Leader, Steven Sample says "thinking free can lead to novel ways of addressing some of the competitive, political, legal, policy and bureaucratic challenges one must confront." In this same thread I say, "Let's build our future, remembering our past." Throw out the bad and retool the good to fit current situations. These are not ridiculous ideas, merely ideas that have not been tried. Understand this first step could be the step up to success. Every man falls down, but we are only judged by if and how we get back up. We all make choices and need to deal with the consequences that arise from those choices, and it is time that we as a community stand and face them. There is no one person that has all of the right answers. Through collaboration, projects are completed, goals are attained, and we will get closer to manifesting our vision. There are no free lunches in life, but I guarantee that the trials, tribulations, hard work, and scraped knees are worth the outcome. Isaiah 43:19 tells us, "See, I am doing a new thing! Now it springs up, do you not perceive it?" Let us make this new vision perceivable. The budget and administration function consists of the development and implementation of the budget with staff input. The council also ensures resources are available to accomplish the duties and tasks established for the staff. The council also sets clear directives for the city manager, city judge and city attorney which they pass to their staffs. The ordinances/boards function consists of investigating and deciding on any new or revised ordinances. This should be done with input from staff, appointed boards/commissions, citizens and other governmental agencies. It is important that the ordinances promote the community vision while not being too restrictive.. In regards to the appointments of boards and commissions, the council needs to be very deliberate. All returning and incoming candidates should be questioned regarding their understanding of the mission of the board or commission. The council then expresses the community's vision and gives guidance on anticipated issues and obstacles that the board/commission members will encounter. The third responsibility of the council is to promote our city by working with other cities, county, state and federal representatives. It is important that we not take a second seat to surrounding cities or organizations. The reputation of the city can be improved with a focused effort. We all live in Apache Junction because we enjoy the atmosphere and small town feel. We can keep this feel while growing into the 21st century to better serve our citizens. The council and city need to focus on three areas to ensure our continued readiness for our future. All three are equally important and can be pursued at the same time like the three allied fronts in World War II. People and businesses will be moving to the east valley and we want to insure that we are ready and welcoming to them. Economic development consists of working with our current businesses and developing new industries. The city needs to ensure that small businesses are treated fairly with appropriate regulations that are not too restrictive. We need to work with the state and federal government to open up available land for development of commercial and industrial parks. Manufacturing and distribution companies need to be incentivized to move to Apache Junction. This will provide much needed well paying jobs bringing more families to our city enabling us to be a driving force in the development of future transportation infrastructure. The goal should be to build the cities economy so that we have a consistent business cycle the entire year, including the summer. The influx of our winter visitors should enhance our community not just be an economic boost we wait all summer to receive. This is done by building our year-round business community and employment opportunities. City infrastructure includes streets, lighting, signage and public facilities. We can maintain our small town western attitude while making the improvements needed to help attract productive families and businesses. It is imperative to understand that it is less expensive to maintain and improve infrastructure on a scheduled and consistent manner then to wait for them to deteriorate to such a level that a total rebuild is necessary. The staff is very good at obtaining grants and working with scarce resources to develop and maintain our city. This is an area that the vision needs to be developed and communicated to the staff and citizens. The third area that we need to address is our public perception and our tourism. We all love Apache Junction but others in the valley and state are not seeing what we have to offer. We are seen as that small town in the east valley with dirt streets and a drug haven. We have a reputation for not funding our schools properly. Visitors know that the Superstition Mountains are out here but do not know how to access all they have to offer. These areas can all be addressed by working with our neighboring cities, county and state representatives and building a concise communications plan. We need to build on our positives and work on our perceived downfalls. One good example would be working with the Gateway airport to promote our city. 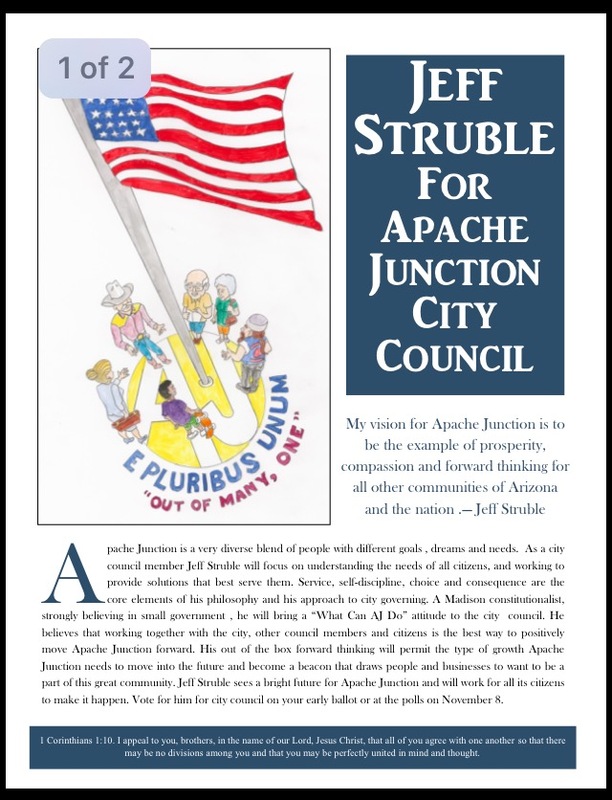 When I am elected to the city council I will strive to work with the other members, staff, and citizens to move Apache Junction into the future. I pride myself in the ability to see the big picture but yet still work on specific issues. I will be a representative of the community as a whole. I will not allow myself to be affiliated with special interest groups. I welcome your assistance and advice to improve the areas of economic development, infrastructure, and reputation/tourism. Let's build our future!